Three weeks ago I wrote you a poem – or something a little bit like one. And I could have just posted it here, but something told me it needed to be delivered to the world in a different way. It needed to be left somewhere, somewhere where everyone or no one might read it. And then it needed to wash away, preferably in the rain. I wanted it to be ephemeral. (I am nothing if not full of foolish ideas). On Sunday, I bought a box of chalk, and I put it in my pocket. 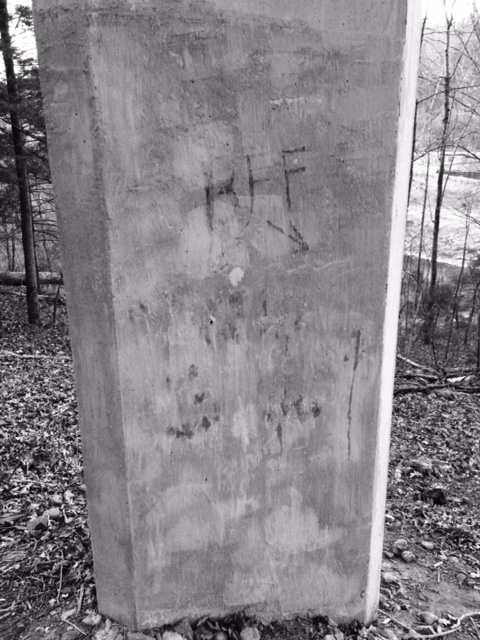 I went into the woods, to the ravine by the river, and I chalked out the poem on a column under the bridge: one stanza for each side of the piling. I chose this place because it was beautiful, but also lonely. Also because there was graffiti there already, and it seemed like this might be a way to leave hope where less-than-hopeful things had been written before. 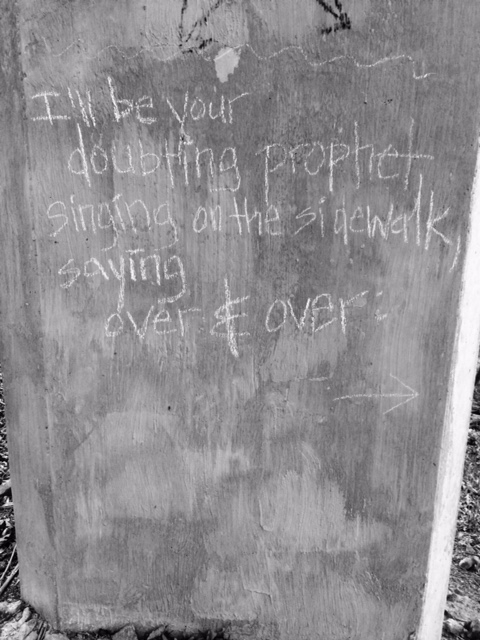 My husband watched as I ground the chalk into the concrete, the fine white dust settling on my sleeves. He took pictures. I’m not sure what he thought of all this craziness. Business as usual, I suppose. I went over the lines harder, trying to make sure the words could be read. I went side by side, appraising. It was enough. In my mind at the time, this was where this story ended. I stood looking at what I’d just wrote — those little words, not profound, but playful, almost. Playfulness can be a kind of courage, and that day it left me feeling peaceful, in a way I hadn’t before. I’d finished what I’d come to do. I looked up. A park ranger stood in front of me, appraising. He had a handsome face. Youngish. You could have called him boyish, and maybe even sweet, in a different context, without that serious look, as if he was waiting for us to bolt. This was when I realized that the story I’m telling you was going to take a different turn. 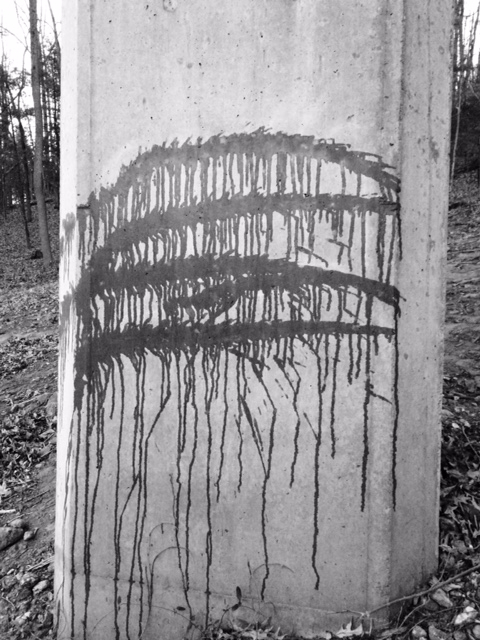 The ranger explained, with careful politeness, that because the area was part of the National Forest, what I was doing was not only illegal, but an offense that could result in arrest — it didn’t matter whether I was writing poetry or profanity, in chalk or in paint. 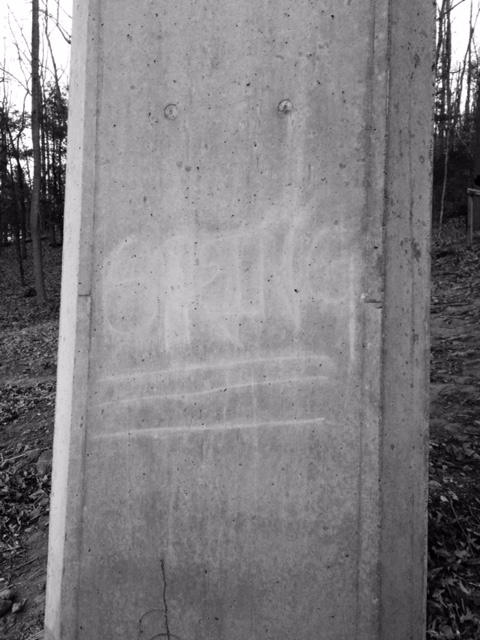 Even chalk poems, he said, would probably invite more of the real graffiti — which actually made perfect sense, when he put it like that. But he’d let me off with a warning, if I washed off all the words. There was a single moment then — just the briefest span of time when the light shifted over his face, in a way that could have been real or imagined — when I thought he might change his mind. 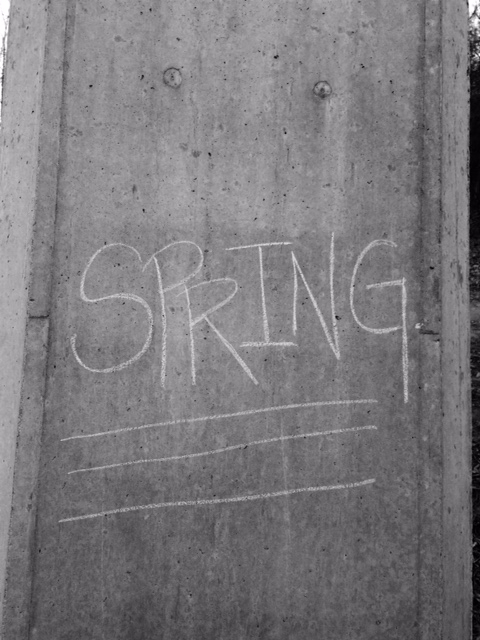 Might let the chalk be until the next rain. But then the moment passed, and I accepted its passing. I stopped, and took a breath. Decided to say something just a little bit brave. Might as well. I watched him. That polite, professional set to his shoulders as he moved down the hill to the column. I had the feeling — I couldn’t shake it — that he was waiting for me to run, or curse him out, or lay down in the leaves kicking and crying like a child. But of course none of that happened, and instead he and Thomas walked slowly around the column, reading. And you know what? When he got to that last panel — SPRING! — he laughed. In relief, perhaps, but also, something like delight. Which was beautiful, I’ll tell you. It was one of the most beautiful things I’ve seen in awhile. After that he walked us back up the hill to his car, took our IDs and wrote up a warning ticket. He sent us back down again with a bottle of water, to wash the concrete clean. 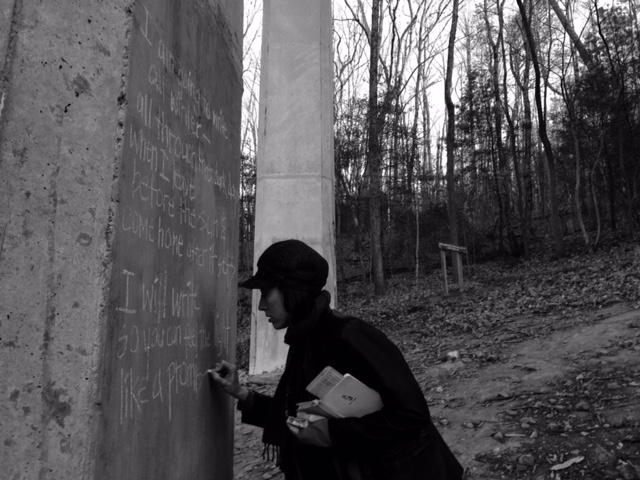 When it was done I stood before those blank planes of concrete, looking and breathing, trying to understand the message that was written on them now. Because I knew that there was one. All week long I’ve kept going back to that moment, trying to hear what this whole story was really about. Because the world has a way of telling the truth about itself, if you take the time to listen. So I listened. And I let this place here — this little place where I leave words for you — go silent. When all was said and done, the words that were attempting to speak a little beauty and goodness and light into the world? 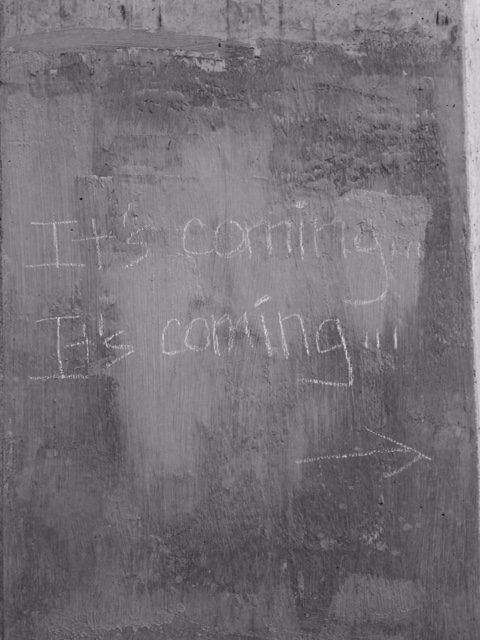 Those were written in chalk, and washed away. And the real graffiti remained. Please hear me: this is not a lament. If we are going to live in this place, this planet, then we are going to have to accept a certain truth: the words that speak darkness and doubt have staying power. They’re everywhere, and any ordinary fool can read them. But the truth-telling voices — those are ephemeral as a glint of sun on the antenna of my car. And if we want to hear those words, we have to be awake. We have to roam the earth with our souls wide-open as wounds, and sometimes, that’s what it feels like. Understand me — please — understand me: This is not a complaint. So here’s my promise to you today. 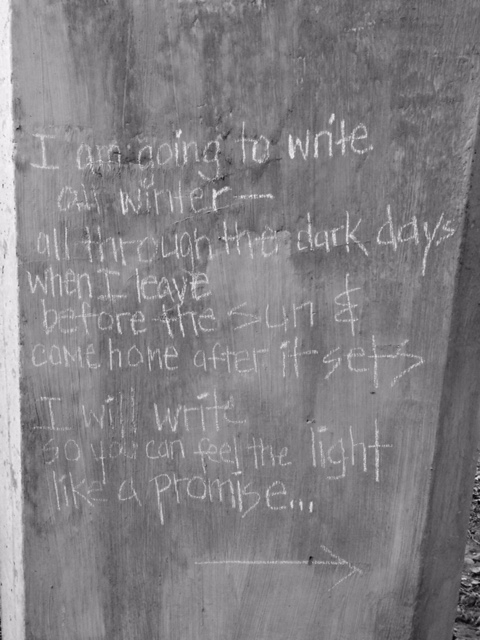 I am going to write all winter. 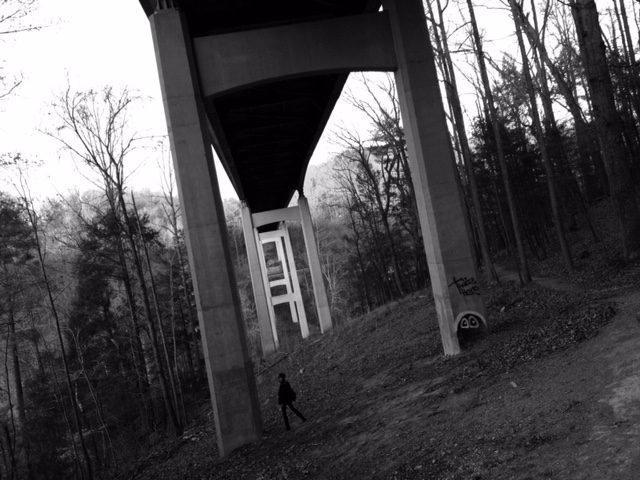 I won’t write in chalk on a bridge in the National Forest, or anywhere else that could land me in jail, but I will try to find spaces for my words where they can be found. And then where they can disappear. Ephemera. I am going to write quick and nimble, or slow and solitary and serene. I am going to write almost-poetry and long lank prose and little shards of thoughts that you can close tight in your palm. I am going to do this so you can believe that there could be crocuses curled warm and safe under the frozen earth, waiting to open to light. Maybe — just maybe — you can believe there are such things curled up in your own soul, too. This story was beyond beautiful. I have a lump in my throat, and can’t help but feel like it is about to sprout bravely into the earth above. Beautiful poem and story! I’ve been meaning to commit to writing more often, and this was just the encouragement to do so … and to do so more creatively. 🙂 Thank you. They say here at my little tip of the continent, we have 4 seasons in one day; well I just went through 4 emotions in a few minutes… first came joy, then a sadness that brought tears to my eyes, then an unbearable sense of loss (and no, I am not exaggerating) and finally a deep sense of relief when your words were read by at least one young lad. What beautiful words … Thank you. I’m grateful for *you*!! I know I’ve taken a long time to reply, but I needed a week to see my way forward. Thank you — sincerely — for reading and commenting and just being here for the journey. I’m glad my words encouraged you!